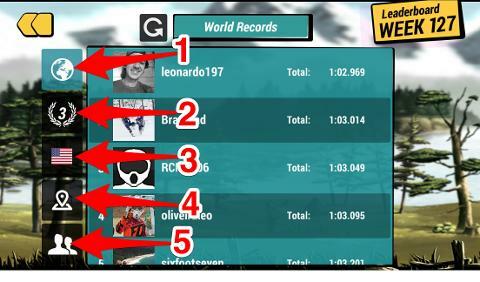 Leaderboards in Mad Skills Motocross 2 are divided into 5 sections for Jam and 4 sections for Career mode. The only difference between the two is that Career mode does not have a Division leaderboard. On the main Jam screen you will see an overview of the leaderboards. 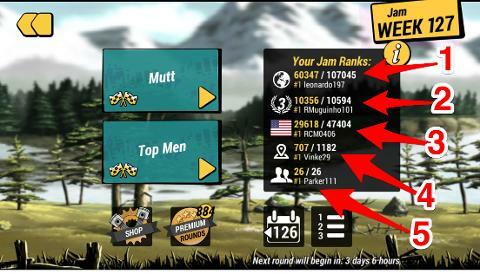 On this screen you will see your current rank based on your overall time on BOTH Jam tracks. If you click on one of the tracks then you will see your rank on just that track. The first number in each section is your rank / followed by the total number of players in that leaderboard category.